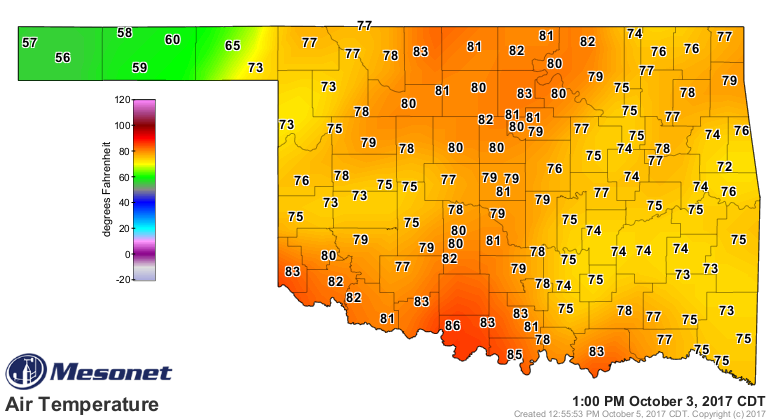 An Oklahoma Mesonet relative humidity map from Tuesday at 1:00 pm showed high relative humidities in the eastern third of the state, lower humidities in the north central and southwest, and mid-range in the Panhandle. The lowest relative humidity was 63 percent at Hollis and Waurika. 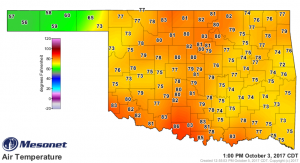 The highest humidity was 98 percent at four locations in the southeast and at Haskell. 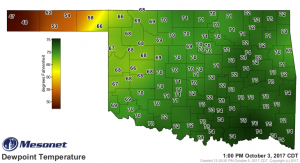 Humidities in the Panhandle ranged from 71 to 81 percent. 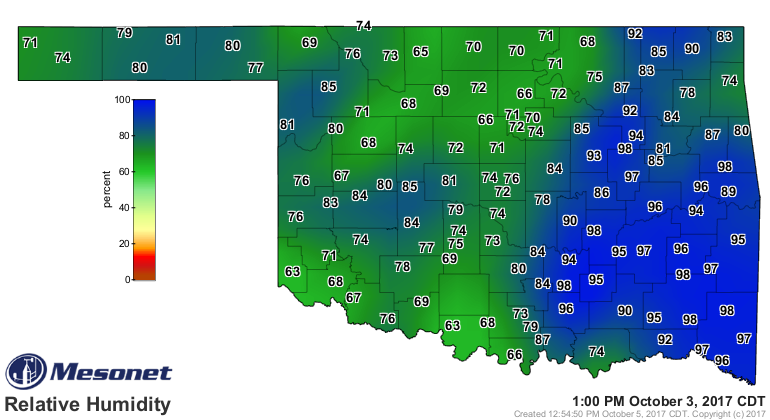 Looking just at relative humidity there was no indication that dry air covered the Panhandle. From this map, the low humidities in the southwest and north central areas, would be considered as the driest. But turning to the dew point temperature map for 1:00 PM Tuesday, the Panhandle was covered by a much dryer air mass. 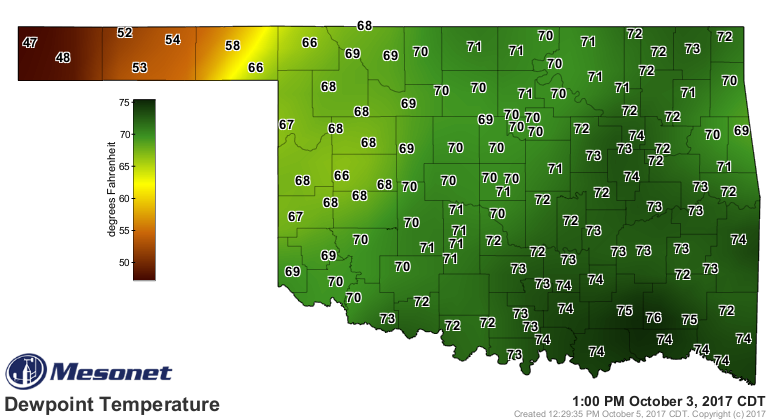 Panhandle dewpoint temperatures were generally twenty degrees lower than dewpoint temperatures in the main part of Oklahoma. So why didn’t the Panhandle relative humidities show this dryer air? The air temperatures for the main part of the state ranged from 72 to 86 degrees. In the Panhandle, where it was dryer, air temperatures ranged from 56 to 65 degrees, close to twenty degrees cooler. Relative humidity can be measured directly or calculated from the difference between the air temperature and the dewpoint temperature. 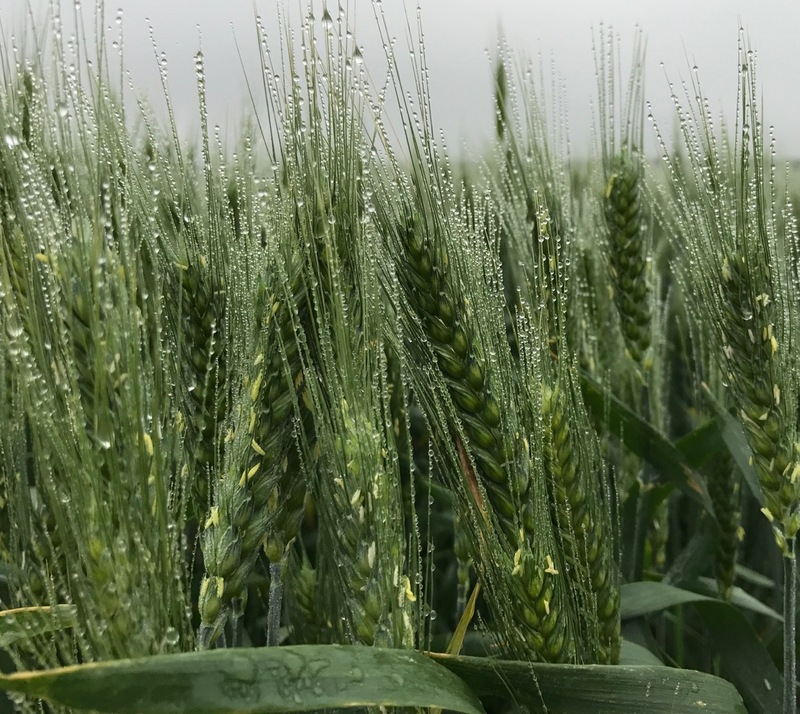 When the air and dewpoint temperatures are equal, the relative humidity is one hundred percent and moisture from water vapor in the air will condense on surfaces as dew. As the air temperature rises and the difference between it and the dewpoint temperature increases, the percent relative humidity decreases. Air does not “hold” water. 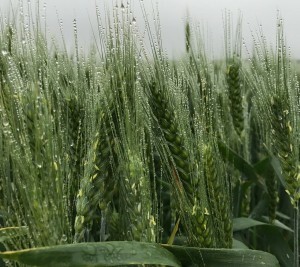 Moisture in air exists as water vapor, an invisible gas in between air molecules. As air warms, it’s capacity to include water vapor increases. Warmer air, more potential water vapor. That is why warm, tropical air masses can produce such high volume, tropical rain events. Colder, arctic air has a much lower water vapor capacity.